The companies, United Teamtrade Sdn Bhd and Memaju Jaya Sdn Bhd, both have ownership ties to powerful BN political figures in Sarawak. 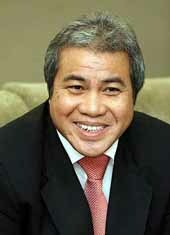 These include Taib’s planning deputy, Awang Tenggah; the state Minister for Entrepreneur Development, Naroden Majais, and the former local YB, Frederick Bayoi. 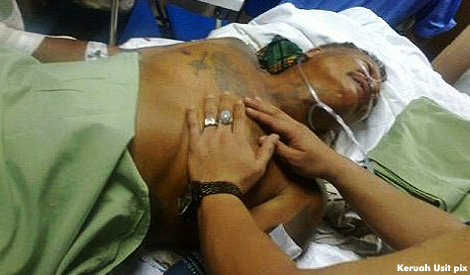 Information on the shocking decision to release the armed thugs was passed to Sarawak Report after the latest spate of assaults on native customary rights landowners, including the hospitalising of a local Tua Rumah Sujau, who was rammed off his motorbike and then beaten with iron bars and sticks. In a related attack on October 15th, a car carrying local people was shot at three times. According to our politically connected sources, the four Melikin-based gangsters were initially arrested on September 30th, after police seized a major arms cache from two workers camps in the Melikin concession areas. The cache included illegal fire arms, explosives, knives and martial arts weapons, according to police statements at the time. 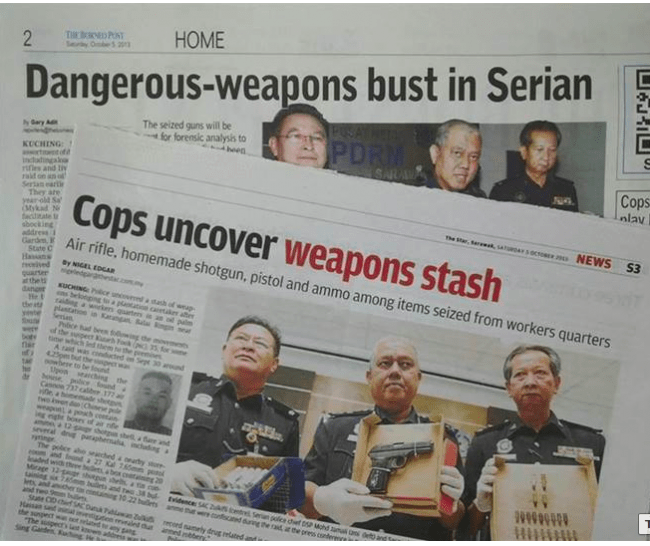 Accordingly, Sarawak Report has been informed, police officers recommended that these dangerous characters should be remanded in custody pending trial. The Department of Public Prosecutions agreed that the remand request should be recommended to the courts. Astonishingly however, the Federal Home Ministry over-ruled the request! Reports are now coming in of sustained intimidation in the area and the situation appears to have escalated out of control with the gangsters starting to compete themselves for timber in the area, outside even of the concessions controversially granted to the logging concerns. Locals say that the racketeers have been purchasing wood from the villages’ pulau galau communal forest areas with the help of certain Tuai Rumah, who have been known to work with logging companies in the past. The impact of this illegal logging has caused the destruction of the local jungle and foraging area and the dramatic pollution of the local river and water supplies for the native people. With the casualty list escalating in this battle and gangsters stripping out even the pulau galau it is even more shocking that the local Serian Police force in the area has reportedly evaporated from the situation. Locals believe that senior police figures have been co-opted by the logging companies and the gangsters to enforce their interests, rather than the interests of law and order. The powerful political figures behind the companies give strength to such arguments. While a growing list of blameless villagers have ended up in hospital, the only arrests that have taken place locally have been of various villagers falsely accused by the logging companies of various crimes, for which they were later found not guilty. “After 7pm the police completely disappear from our area”, one contact has reported. ”Then the lorries all come out carrying the timber, under cover of darkness”. 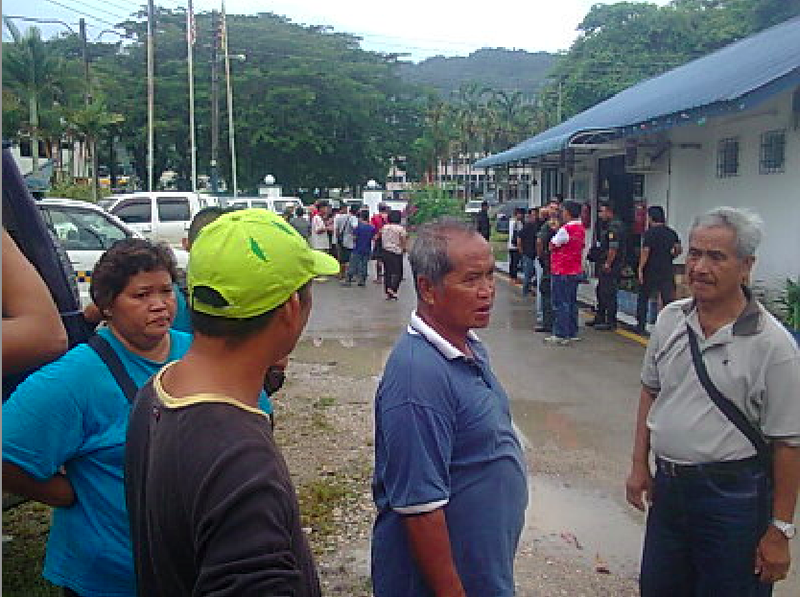 With matters rapidly moving out of control in Sarawak, in the face of a rash of provocative injustices perpetrated against the Dayak peoples’ basic rights, key questions arise on how the police are being directed to keep law and order. 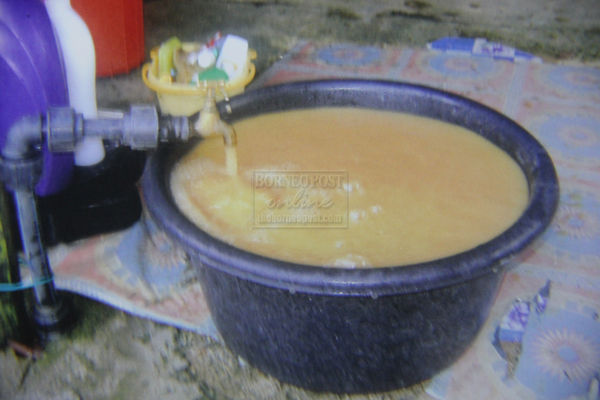 Why is it that there are no police on the ground to protect villagers against gangsters in Melikin, whilst over in Sungai Sebatu, Suai near Miri a large contingent of police was gathered from all over the state to arrest villagers harvesting oil palm on their own native lands? After the arbitrary rounding up by police on November 1st, eight native people, including a 9 year old and and an 11 year old boy were left to languish for days in jail in Miri, for allegedly picking fruit on what they claim is their own native customary land, illegally alienated by the state government. Once again in this case the police have intervened on behalf of the plantation companies over a matter that is being legally contested in the courts. The police have acted in such a way, even though time and again the state government and plantation companies have been losing similar court actions after the laws permitting such alienation of native lands were ruled to be unconstitutional. So, why are the police harassing natives in these cases, instead of preventing the powerful logging and plantation companies from sending in gangsters and bullies to enforce illegal concessions granted by the Chief Minister to his cronies? 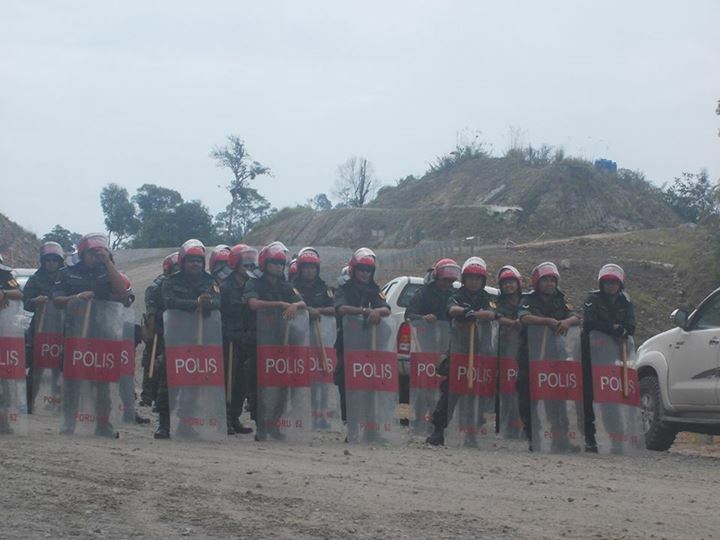 Likewise, why are scores of riot police confronting peaceful Penan men, women and children at the Murum Dam site and shooting guns over their heads, rather than getting down to Melikin, Serian and doing a real, honest job of sorting out the tattooed thugs, who are attacking local people and stealing wood from their pulau galau? Is the Federal Government now so completely in hock to Taib Mahmud and the rigged seats that he delivers to keep BN in power, that it cannot now even go about their basic job of keeping law and order? Sadly, in Sarawak this appears to be the case. The police are being used to protect Taib’s thieving cronies as they break the law and use thugs and gangsters against the common people. awang Tanah is still active in land grabbing? Now gangsters are working for him or is it him who is now working for the gangsters? Either way, the natives are the victims of their greed. Why are the authority so fast in arresting the natives in Niah but they disappear for the “LACK” of manpower when it comes to protecting those natives in Melikin who are really in need of protection? If the police cannot give serious protection to the Melikin folks, perhaps these folks should form some kind of kampong security force to counter these threat from these cowards who hides behind those land grabbing so called YANG BERHORMAT! The kampong people should be given the authority to arrest these trouble makers! Two Sibu ” samseng” brothers had been alienated state land for plantation. Apart from having to pay for land premium to the Land and Survey Department, these selected beneficiaries of state land had to give under the table money of not less than RM1,500.00 per acre to secure the deal. Wong Soon Koh is the broker and Awang Tengah is the authorised signatory. 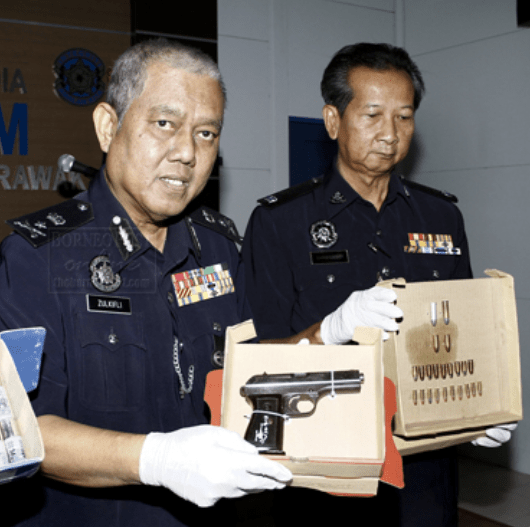 The KL GANGSTER 2 movie promotes gangsterism, now we see the consequences. The censorship board dropped the rating from 18 to 13 to allow more young people to watch and emulate the gangster behaviour of the movie. Thanks to Sarawak Report, the intimidation by the timber crooks and their corrupt political benefactors has become common knowledge. 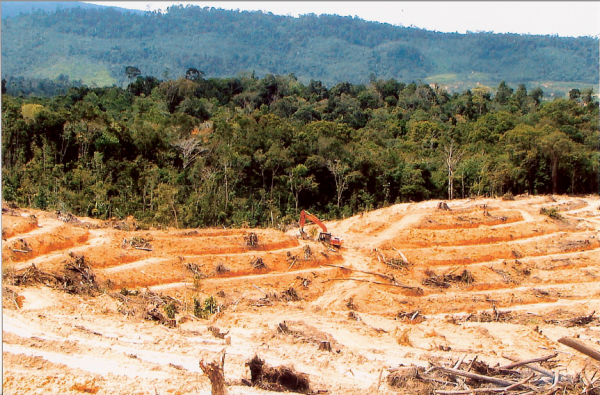 The Dayaks should wake up to all these plundering of their land and timber. Be assured that after stealing the timber on their land, the next target will be the land itself. Because of their political connection and protection of the police, these crooks are not afraid of a few land owners who dare to stand against them. Your only salvation is to kick the corrupt politicians out. But are you ready for that? Time is running out and your children may be left with nothing to inherit if you continue to support the BN. Think wisely my fellowmen.